Today (November 15th 2018) the new Raspberry Pi Model 3 A+ was released, four years after the release of the original Raspberry Pi Model A+. The new A+ is a physically smaller (65mm × 56.5mm compared to 85.6mm × 56.5mm) and cheaper (US$25 compared to US$35) version of the Raspberry Pi Model 3 B+ with slightly reduced features. 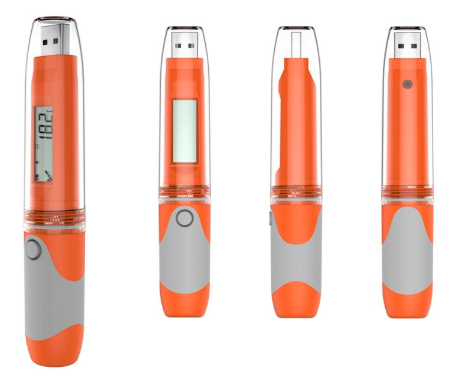 The A+ has just one USB 2.0, the B+ has four. The A+ has half the LPDDR2 RAM of the B+ with 512MB compared to 1GB. And, the A+ has no ethernet port whereas the B+ has gigabit ethernet connectivity. 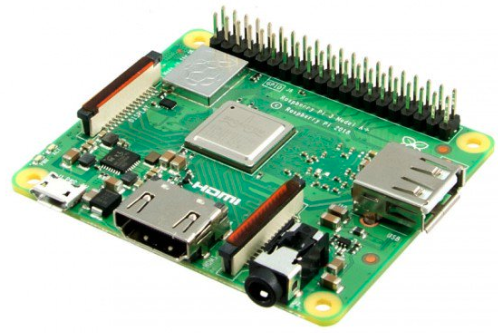 The Raspberry Pi Model 3 A+ and B+ share the same 1.4GHz quad-core Arm Cortex A53 processor, and the same WiFi and Bluetooth connectivity. Pictured below is a two-channel thermometer we recently built for a customer. 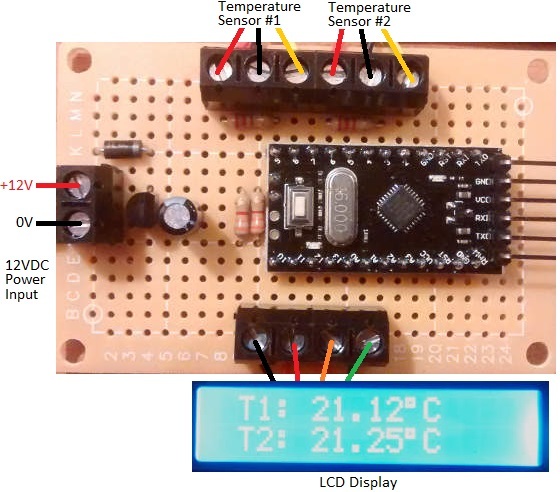 This device takes inputs from two ds18b20 temperature sensors and displays their measured temperatures on a 1602 LCD display module. 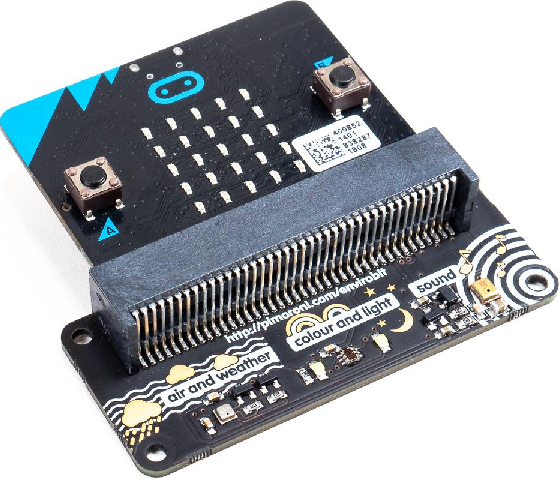 The thermometer is built around an Arduino Pro Mini. Below is the full Arduino sketch (code) for our device. 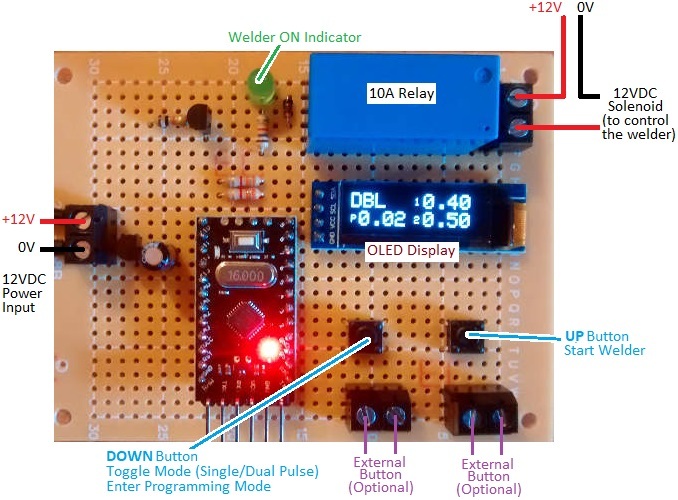 See this guide to Connecting an I2C Display to Arduino for the LCD connections. We have added the necessary 3k3 pull up resistors between pin A4 and 5V, and pin A5 and 5V – click here to read about I2C Pull Up Resistors. We have also used an external 5V regulator rather than relying on the 5V regulator built into the Arduino Pro Mini, and added reverse polarity protection on the input with a 1N4001 diode. // Double Thermometer with Display. // For the DS18B20 temperature sensors. // Data wires are plugged into pins 2 and 3 on the arduino. // For the 1602 LCD module. // Setup a oneWire instances to communicate with OneWire devices. // Start up the temperature sensor library. // ADC (12 bit is much slower but higher resolution). // Switch on the LCD backlight. // Clear the LCD screen. // Read in the temperatures of the two sensors. // Display the temperatures of the sensors on the LCD. If you need any kind of bespoke thermometer or thermostat, please email neil@reuk.co.uk with details of your specific requirements. Pictured below is a new hen house door controller we recently made for a customer. Our most common design for a door opener/closer is our Dawn Dusk Henhouse Door Controller – a device which uses a couple of roller limit switches to keep track of the position of the door, and a light detector to detect dawn and dusk. This new device is designed for operation with an aluminium screen door opened and closed by a linear actuator which has its own internal limit switches. At dawn, voltage is supplied to the actuator for one minute giving the actuator time to fully open the door with no worries that it will overrun thanks to the limit switches. At dusk, reverse polarity voltage is supplied to the actuator one one minute to close the door. The user can set the ambient light level threshold at which the door will open or close. A further requirement for this controller was the ability to manually open or close the door at any time in order to give access to the chicken run. For this the user can select manual mode, and use the lower door or raise door buttons when they need to use the door. The controller keeps track of the position of the door during manual operation which is vital as there are no limit switches connected to the controller to tell it where the door is. On board buttons are available, but also screw in terminals so that external push-to-make buttons can be more conveniently located. If you need any kind of door controller, please email neil@reuk.co.uk with details of your requirements. 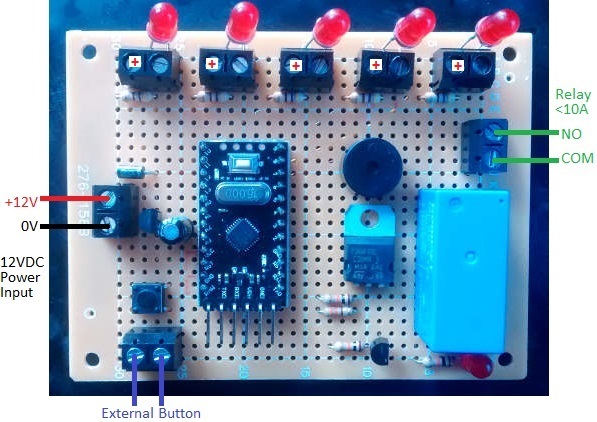 With the board connected up as per the diagram, the first step is to set the light detector threshold. The light detector is not waterproof, so it must be protected from rain, but also positioned so that it is exposed to natural light. The leads to the light detector can be extended to get it in an optimal safe location. In the late afternoon / evening when the ambient light is at the level below which you want the door to be closed, press and hold the calibrate light detector button for more than one second. The red and green LEDs will then alternately flash for a few seconds and the current measured light level will be saved in memory as the night-dawn and day-dusk threshold. If the yellow LED is on, the device is in manual mode. To toggle between manual and automatic mode, press the choose auto/manual button. In manual mode, pressing the manual lower door button will see power output to the actuator for one minute to close the door. (If during that one minute, you press the manual raise door button, power to the actuator will be cut leaving the door somewhere between open and closed.) Similarly, you can manually open the door by pressing the manual raise door button. If you find that pressing the button to close the door instead opens the door, reverse the polarity of the power connections to the actuator. When it gets ‘dark’ – light level measured to be below the user set threshold – the red LED will turn on. After 10 seconds of continuous ‘darkness’, the door will automatically be closed with power supplied to the actuator for one minute and the actuator’s internal limit switches preventing the door from overrunning. Now the device will sleep for two hours – red and green LEDs alternately flashing – so that no false dawns are detected if the skies suddenly brighten. After the sleep, it will now be very dark. The device will wait through the night until dawn – light level measured to be above the user set threshold – and then turn on the green LED. After 10 seconds of continuous ‘light’, the door will automatically open, again followed by a 2 hour sleep to prevent the detection of a false dusk if clouds cover the sun. Pictured above is a timer we recently built for a customer which will be used in a Formula 1 style race start lighting gantry. This gantry will be fitted at the top of a slope with toy cars held by a small gate latched up by a small solenoid with a spring loaded core. When the race is to start, the solenoid is energised which drops the gate allowing the cars to roll down the slope in their race. In the photograph, five red LEDs are temporarily attached to the timer board for testing, but these will be mounted into the gantry across the track when it is finished. 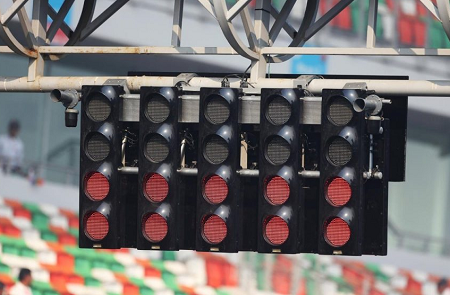 When the user presses the button, the LEDs follow the standard F1 race start sequence – each red LED turns on in sequence with a one second interval. As each LED turns on, an on board piezo buzzer briefly pips. Then, when all five LEDs are illuminated, there is a random time interval of between 1 and 3 seconds before all the LEDs are turned off. The lights turning off indicates that the race is to start. The buzzer sounds for 1 second, while the on board relay energises for 1 second to energise the solenoid and start the race. If you need any kind of bespoke timer or controller, please email neil@reuk.co.uk with details of your requirements. Pictured above is a solar water heating pump controller we recently made for a customer. 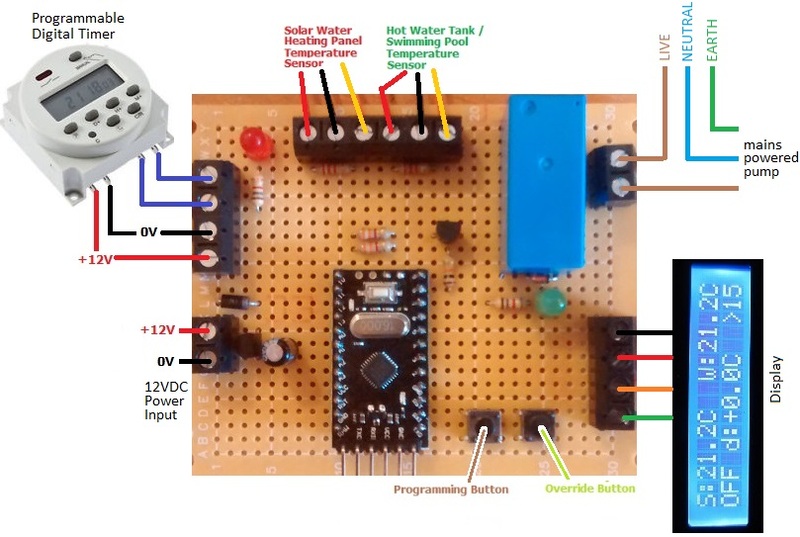 This device is based around our popular 2016 solar water heating pump controller with display and datalogger, but has some added features. The first added feature is a maximum temperature override. As this device will be used for solar heating of a swimming pool, we added user programmable maximum pool temperature override. If the pool starts to get too hot, the pump bringing hot water from the solar panel will not be run again until the pool temperature has fallen by at least two degrees Celcius. The second added feature which we have not been asked for before is a timer override. The user of this device only wants the pump to be allowed to run between 10am and 4pm, so we have added a 12V programmable digital timer so that the user can set the times of operation of the heating system. If you need any kind of pump controller or timer, please email neil@reuk.co.uk with details of your requirements. 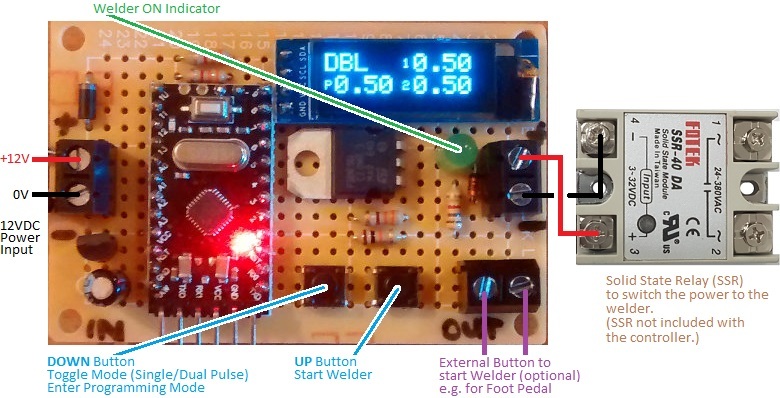 Pictured below is our popular 12VDC dual pulse spot welder timer controller which we designed, build, and sell. Spot welding (resistance spot welding – RSW) is used to join metal surfaces by passing a large electric current through them. Because of the heat generated by the resistance to the electric current, the contacting metals melt together forming a weld at the spot through which the current is passing. In order to get good clean reliable welds and not to burn holes through the metal, it is essential that the pulse of electric current is of a suitable duration which depends on the types and thicknesses of the metals to be welded as well as many other factors. Therefore an accurate timer controller is required for consistent welds. For the best spot welds, a dual pulse controller is used in which the electric current flows for a time (pre-weld), then there is a brief pause, and then electric current flows again (welding). The first pulse clears away any plating or surface oxidation, and then the second pulse welds the now clean base materials together. Using a dual pulse welder also reduces spitting. Our controller offers two modes of operation: single pulse mode and dual/double pulse mode. Pictured below is a view of the built in OLED display when in dual pulse mode. 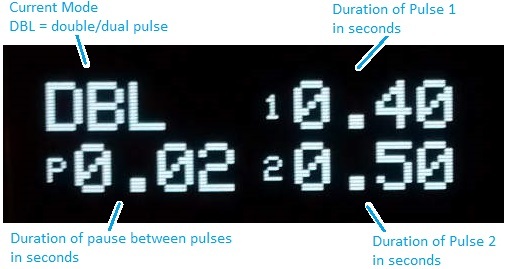 The user can set the durations of Pulse 1, the pause time, and Pulse 2 in 0.01 second steps between 0.01 and 1.99 seconds. On board buttons are provided for toggling between the single and double pulse modes, entering programming mode to set the timings, and making a spot weld with the displayed settings. Screw in terminals are provided so that external buttons can be connected – for example a foot pedal to make a weld with your hands free. 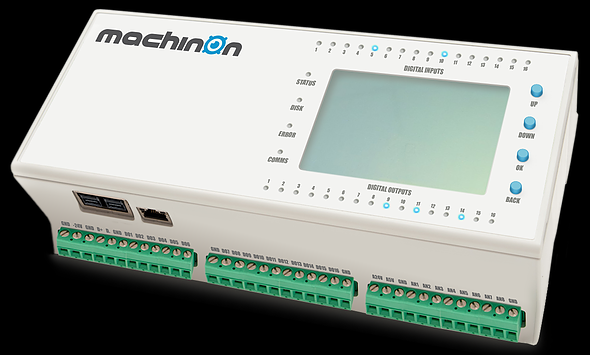 This version of the welder controller is fitted with a 10A relay which can be used to power a < 5A rated solenoid which in turn switches the welder. For any type of welder timer controller, please email neil@reuk.co.uk with details of any special requirements. Our controller as described above is available at £21.95 plus postage. If you require a timer which will be switching more than 10 Amps of current for your welding setup, then we also make the alternative devices pictured below which have a 1 Amp 12V output for connection to your own solid state relay (SSR) or mechanical relay. These are available for £19.95 plus postage – no relay included. 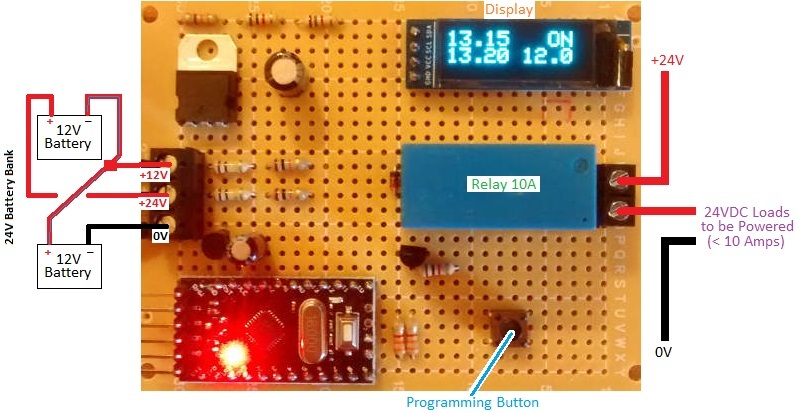 Click here for a source of solid state relays. If you require a bespoke device which pulses the welder with very brief times and higher time resolution – e.g. 0.001s – 1.999s instead of 0.01-1.99s – we can modify the above photographed timer controller…but only for use with a solid state relay (since SSRs can switch in 1ms (0.001s) rather than the 10’s of milliseconds it can potentially take a mechanical relay to switch). Contact us with details of your specific requirements for a quotation. There are two buttons on the controller. If you press the ‘down’ button, you can toggle between single pulse and dual/double pulse operation. 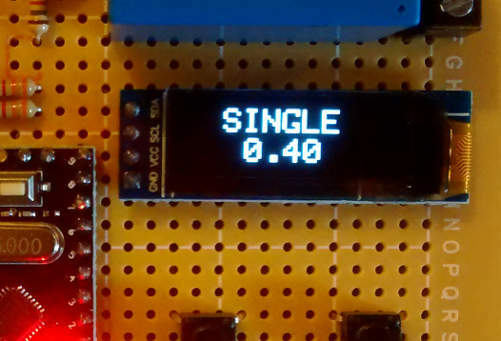 The display will change to show which mode you are in: SINGLE or DBL (double) as well as showing the durations currently programmed into the device. If you press the up button, the controller will run. The relay will close for the duration of Time 1 and then open again. If you are in double pulse mode, it will then remain open for the duration of Pause Time and then close for the duration of Time 2. In addition to the buttons on the controller board itself, screw in terminals are provided to which you can connect external buttons of your choosing – e.g. a foot pedal operated button, or a larger hand operated button etc for your own convenience.